Antrim Creek Natural Area is a 156-acre tract that lies just south of the Charlevoix/Antrim County Line and only 1.5 miles from US-31. 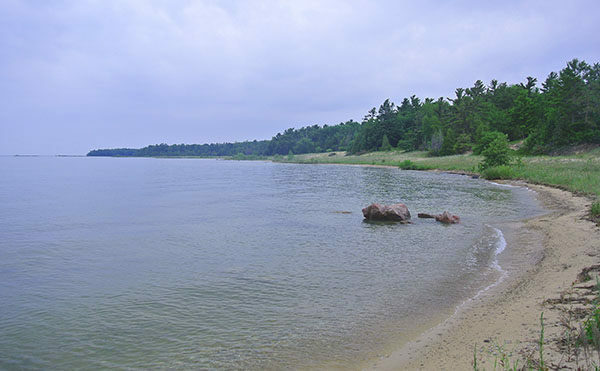 Its most notable feature is the nearly one mile of Grand Traverse Bay shoreline, the longest stretch of undeveloped coastline remaining within the entire 132 miles of the bay between Norwood and Northport. But for the historian and the naturalist the Antrim County park is an intriguing place to take a hike. Antrim Creek is home to an array of natural diversity including hardwood forest, forested wetland, conifer swamp, shrub thicket, meadow, wet meadow and coastal dunes. But for the historian and the naturalist the Antrim County park is an intriguing place to take a hike. Antrim Creek is home to an array of natural diversity including hardwood forest, forested wetland, conifer swamp, shrub thicket, meadow, wet meadow and coastal dunes. It supports a wide range of flora and fauna including tow endangered plants; Pitcher's Thistle and Lake Huron Tansy. 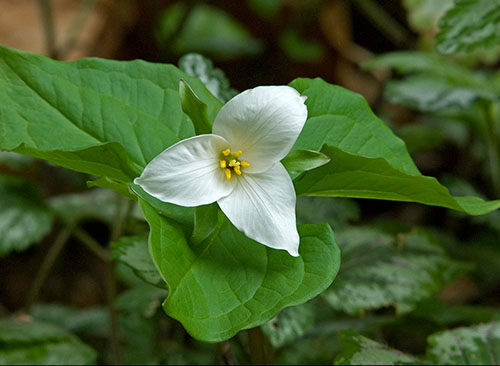 In the spring wildflower enthusiasts to see Starflower, Indian Pipe, Yellow Trout Lily, Wood Lily, Columbine, Twin Flower, and Jack-In-The Pulpit blooming in all their glory. 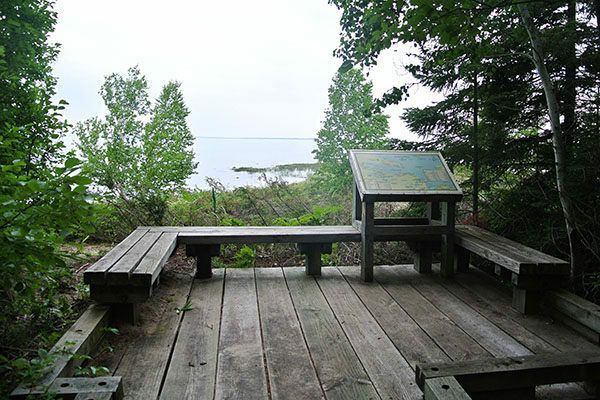 The natural area also has a long history beginning with Native Americans using the spot as the closest embarkation point to cross Grand Traverse Bay to the Leelanau Peninsula. In the mid-1800s Antrim City was founded and peaked in 1873 with 200 residents, a school, post office and grist mill. You could catch a stage coach here south to Elk Rapids for $1.50 or north to Charlevoix for a $1. The lumber town was also a regular stop for steamships traveling between Traverse City and Petoskey. When the timber was depleted in the mid-1880s, Antrim City quickly became a ghost town. In the 1930s the area was the site of Tyrrell’s Vacation Camp and in 1943 the tract purchased by Harry and Eleanor Jones. Over the duration of their 53-year stewardship , the Jones family kept the tract undeveloped and open to locals for swimming, hiking, hunting, fishing, cross country skiing, and snowshoeing. This northern Michigan gem was saved from residential development when Grand Traverse Regional Land Conservancy worked with the Jones family and local officials from Antrim County teamed to purchase the property in 1994 and permanently protect it as the Antrim Creek Natural Area. Extending across the park is a 2.5-mile network of trails including more than a half mile of handicap accessible paths and several interpretive stations. The hike described here is a 2.1-mile loop of most of the trail segments beginning at the South Entrance trailhead. From the trailhead in the South Entrance you begin on the South Barrier-Free Loop heading west towards Grand Traverse Bay. Within a few steps is Creek Overlook, a bench that allows you to sit and peer down into the wooded ravine that Antrim Creek flows through. At the first junction you continue west (left) follow the stream along Creek Trail, descending pass the junction with Nipissing Trail and reaching the mouth of Antrim Creek at Mile 0.25. It’s a scenic spot, among the shoreline dunes the creek weaves its way into the blue horizon that is Grand Traverse Bay. Backtrack to Nipissing Trail and head north on it. 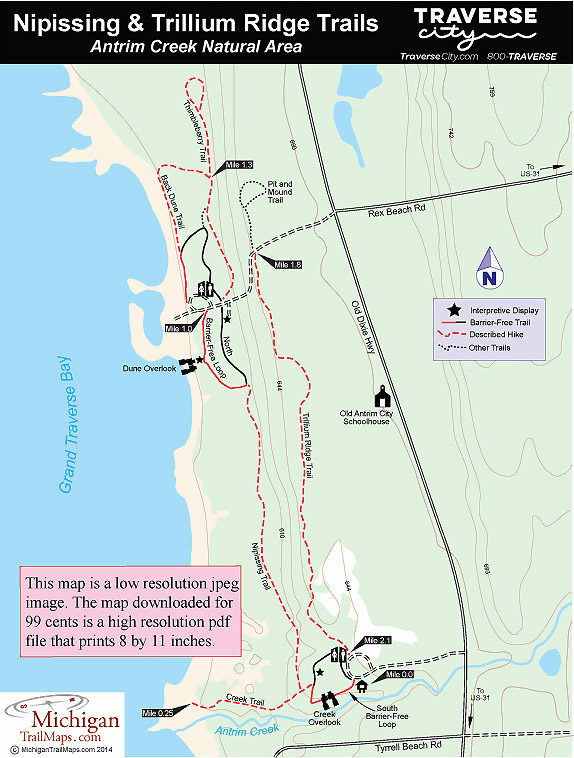 In less than a half mile you reach the junction of North Barrier-Free Loop and by heading west (left) will be at the Dune Overlook at Mile 0.9. 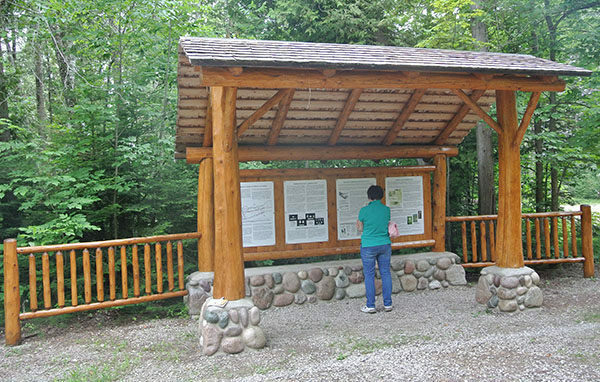 The viewing platform provides a view of the shoreline while an interpretive display provides more background on the Native American history of the region. Continue along the Barrier-Free Trail and at Mile1 you arrive at the North Entrance Road. The trail skirts the drive loop and continues north where in less than a quarter mile reaches the junction with the Back Dune Trail. This segment skirts the shoreline dunes before swinging east and arriving at Thimbleberry Trail at Mile 1.3. Head north (left) to hike this segment. The entire trail is only third of a mile and includes backtracking a portion of it. You end up back at the North Entrance Road where you head east (left) to follow it up the bluff that splits the park in half. At Mile 1.8, you reach the junction where Pit and Mound Trail heads north and you continue south along Trillium Ridge Trail. The path is a level walk that hugs the edge of the ridge and then passes through an interesting stand of cedar. Eventually you skirt an old farm field and then emerge at the South Entrance parking area at Mile 2.1. The Antrim Creek Natural Area offers a trail system, beach access, parking and bathroom facilities. The Antrim Creek Natural Area is open daily to the public free of charge. In the winter the ungroomed trails are favorites among cross-country skiers. Follow US 31 to the intersection of Rex Beach Road and US 31 in Atwood. Go West on Rex Beach Road until it ends at Old Dixie Highway. The entrance of Antrim Creek Natural Area is located on the west side of Old Dixie Highway. South entrance is 0.6 mile south of Rex Beach Road on the west side of Old Dixie Highway. Contact the Antrim County Administration & Planning Office (231-533-6265; www.antrimcounty.org/acna/) or the Grand Traverse Regional Land Conservancy Conservation District (231-929-7911; www.gtrlc.org/). For lodging or travel information contact Traverse City Tourism (800-872-8377; www.traversecity.com).